Designed to protect the hands while performing tasks requiring good tactility, the 13-gauge Ansell HyFlex 11-949 Fully Coated Tactile Handling Work Gloves combine cut and abrasion resistance with residual oil repellence. The gloves feature very good grip properties to reduce the risk of oily or greasy parts slipping, while also offering a flexible and comfortable fit for improved wear. The product code for the pair of gloves is: 11-949. Tasks requiring fine tactile handling require hands to be able to remain flexible enough to effectively handle objects and perform well. The 11-949 gloves have been designed with this in mind, allowing hands to remain comfortable and flexible without compromise to protection. 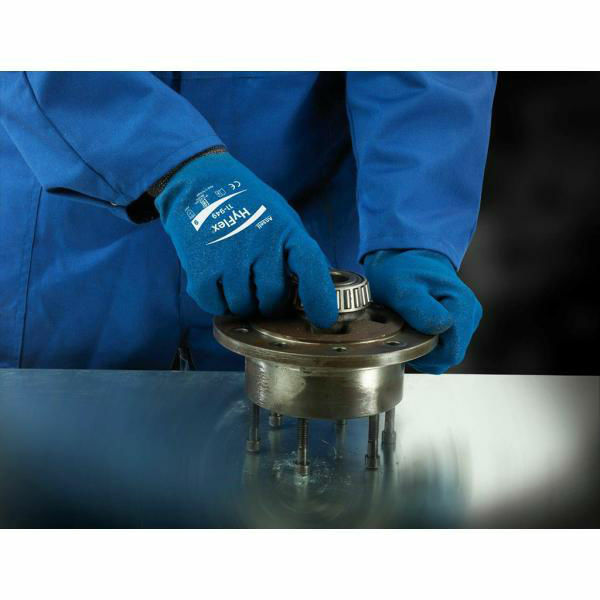 The Fully Coated Tactile Handling Work Gloves offer good cut and abrasion resistance to protect hands from coarse objects, while also allowing hands to remain flexible and comfortable. This ensures they can remain comfortable while working, ideal for tasks requiring tactile handling. The table below showcases the test results of the Ansell HyFlex 11-949 gloves according to EN 388 Mechanical Risk specifications. The Ansell HyFlex 11-949 Gloves are available in a choice of sizes, making them suitable for most users. Please consult the table below for details, then select the required size from the drop-down menu at the top of the page. The glove length will range from 220mm to 260mm.